WHYP: 4065U, 10/31, 1835+ Thanks to a Chris Smolinski log, I heard a pirate down where I wouldn't've thought to look so early in the afternoon. I tuned in, started recording, and left to plane a door. After about 15 min., the station signed off. Afterward, I checked the recording and most of what I had recorded was mistuned. In about the last two minutes or so of the broadcast, everything locked in and the audio sounded great. Not positive, but I think JB was adjusting the tuning . . . or maybe the transmitter drifted? WHYP: 4065U, 10/31, 2210+ Very strong and good audio with 2002 Halloween special: JB, LCee, Jay, & more. I guess the brief show at 1835 was a warm-up test for this broadcast. Ended with "Zeller Mash" & George smashing down the studio door, insulting the program, a Brownyard yay-yay-yay chorus, Cpt. Ganja with contact info, Al Fansome, then a loop IS of a girl saying something & giggling. Now, spooky organ music, so maybe that was just the end of the program but not the broadcast? I heard that a station was on with Elvis music on 4073 and that the OTR unid was back on 6770. Neither were audible, so I went for a band scan. Radio Voyager (Europe): 6950, 10/31, 2259+ Fair signal with light pop. The R8's dumb sync detector can't lock on. Hearing some pescadores on the frequency, too. Nice to hear a new (for me) Europirate. Unusually good signal. Also, they offer a lot of well-done eQSLs, so it's worth writing in. Wolverine Radio: 6935U, 10/31, 2322+ Bells, then every Halloween sound effect known to man seems to be crammed into the first few minutes: a variety of screams, moans, swirling sounds, water dripping, creaking doors, growling, moans, boiling something, owls, birds, maybe a cow crying? VG signal. Ha! It's the beginning of the Wolverine Radio Halloween show! ID after about 10 min. of sound effects. Laser Hot Hits (Europe): 6205, 10/31, 2358+ OK, this one's audible a lot in North America but the signal's really pretty decent tonight. Basically '80s pop format with a DJ. They tend to air live shows over the weekend, then record them to repeat through the week. Lupo Radio (tentative): 6973, 11/1, 0316+ This is tentative--a weak signal with bits of audio on their usual frequency. Assuming that this is Lupo, this is a great chance for West Coast DXers to hear it (usually, it signs off by around 0100 UTC). Yeah Man Radio: 6925.5, 10/27, 2145+ Jazz music. DJ asked for listeners to check into HF Underground & log the station, so I did. 1710 kHz, 10/29, 0314+ Checked the frequency and it was surprisingly free of local noise. Actually listenable. I thought that at tune in, I heard some quick fading from a Spanish station, but maybe that was just wishful thinking. I'm sure that I heard one or 2 TIS stations on the frequency and possibly more signals. Unlike most of the times when I'm listening to 1710 in the car and I have either nothing or just the Hudson Co. TIS fading in really clearly, most of the time here, it was a few weak signals at about the same level. After checking the recording a bit, I had a clear fade up of an older vocal song at 0450, then in faded the Hudson Co. TIS with their storm surge emergency procedures. I'd like to think that the station airing the vocal song was a pirate (Radio Reten Lo Que Tienes, in particular), but at this point, I can't rule out the possibilities of a spur or receiver image. KVR: 6925U, 10/29, 1304-1306* Sounded like instrumental movie music, then Morse code. Station signed on over top of the CW in AM mode. ID per HFU. unid: 6925, 10/29, *1306-1321* Police "Wrapped around Your Finger," Clash "Rock the Casbah," & a few other songs.Very strong. I assume the same station was also on *1336-1341*, *1350-1351*, *1401-1405*, *1416-1417*, *1435-1438*, & *1452-1455* with similar signals & songs. unid: 6925, 10/29, ca.1630 My R8 was still in USB mode when I came back to the radio, so I tuned it in USB, switched to AM and the station went off. My guess is this was the station just above. unid: 6955, 10/29, 1705+ Lively Latino music. Good signal, but audio sounds really tinny. Into rock music, including Steve Miller "The Joker," & "Nowhere to Run." Recycle Radio: 6950, 10/29, 1955+ '60s garage rock ("Stepping Stone" Abaddon "Blues Today," The Haunted "1-2-5") + lighter '60s pop, too. Yeah Man Radio: 6925.6, 10/29, 2019+ Jazzy instrumental song, then the announcer mentioned listening to Recycle Radio on 6950 before. Shoutouts to listeners on HFU. Good, maybe VG signal. Clever Name Radio: 6935U, 10/29, 2102+ Excellent signal with Jimi Hendrix & others. Missed a lot of the show because I finally brought the SX-42 up to 110 V and started listening around (or trying to) while this show was on in the background. Radio Merlin International: 6305, 10/28, 1628+ Clear ID, pop/rock music "I Want Candy" "Time Warp"
Today's the beginning of the Halloween radio weekend. I don't yet have any loggings, but I really do need to come up with some separate antennas and listening/recording arrangements so that I can log and record a few more broadcasts. In the South, be listening for Radio Reten Lo Que Tienes on 1710 kHz, which has been reported by a few listeners in Georgia. Signals have been strong, so it will be interesting to see just how far it will be reported. They have an impressive website. I've received an e-mail that a new Halloween pirate, Creepy Radio, will be broadcasting this weekend on shortwave. I've also received some e-mails from some pirates who plan to be on the air for the Global HF radio weekend, so we should have a few special broadcasts to be tuning around for. I received a QSL from Lupo Radio from Argentina. He sent some information about his station, but I want to check with the operator before posting anything. Chris Smolinski received successful tests from Chilean pirate Radio Compania Worldwide on 6925.1 kHz. It looks like we might be on the cusp of another renaissance of South American pirate radio activity, which is kind of amazing, considering that the really active stations from the '90s, such as Radio Cochiguaz, Radio Blandengue, and AARS, have not returned. I've been posting about the Global HF Weekend and sending e-mails about it, but don't forget that Halloween is the big weekend in North American pirate radio. In Europe, Halloween is pretty much just another weekend, but over here, you can expect a few Halloween-only stations to appear + holiday-themed broadcasts from a number of others. In past years, during the prime times (about 2100-0100 UTC), we've had as many as six stations on the air at the same time. Of course, being prepared for Halloween means being there and listening. But if you have the equipment available, it also means having as many receivers as possible ready to tune in pirates and as many recording devices as possible ready to save the audio. I currently only have one antenna up, so preparing for Halloween means that I need to set up another one, whether something specific or just a random wire so that I can tune in and record strong signals on a secondary receiver. It also means that I need to have another computer and the audio cable ready to record. I'd like to be capable of recording on three frequencies at once, but both of my 10-year-old laptops recently died and I have to ask myself if it's worth it to record onto cassette and then convert that audio to MP3 files later. Of course, this is where the spectrum-grabbing capabilities of SDRs are truly useful--and I might just need to revisit it (imagine that). If you have an SDR and can save a chunk of the spectrum, this is the time to do it. And if you live in Europe and want to hear some North American pirates, the SDRs are useful for picking out weak bits of audio on fade-ups from a few different stations that might not be fading in for long. Speaking of Europe and DXing pirates, given the erratic nature of pirate radio in North America, it might not be worth it for many listeners in Europe to stay up well past midnight listening, but if you want to try it, Halloween is your best bet. A few guys (unfortunately, just a few) from Europe regularly hear North American pirates and post on the HF Underground (I won't mention names in case they don't want the publicity, but some of the current active loggers are from Germany, Belgium, Italy, and the Ukraine and their reports are greatly appreciated), so signals should be audible across Europe on a regular basis. The variable here is propagation and the nemesis is local noise levels from computers, lights, signs, transformers, etc. A noisy environment can hinder or eliminate your chances of hearing some real DX. I wanted to just write a little note about we shouldn't forget about Halloween, but this is turning into a full-out article! Sorry to babble on! Have a great weekend and, oh, Halloween-themed pirate radio tends to start a few weeks before Halloween (so that ops can get extra mileage out of their programs and because propagation varies). Just last night, Halloween Radio Shortwave was logged. I've never been into the "newest, fastest, bestest" technology. I know that a lot of shortwave fans, if not of the present, then certainly the past, were into the hobby because of their desire to experience the cutting edge. That's not me. My connection (or one of them) with shortwave--especially pirate radio and low-power private stations--has been more low brow. I've been fascinated with things like messages in bottles and old graffiti. To me, there's something wonderfully personally impersonal about a message in a bottle. Although it's been tossed out into the unknown, as impersonal as can be, it's meant for one person: who ever finds it. In the case of graffiti, at the moment at least, I'm not too interested in the high school hood who tags every trashcan, bridge overpass, and bathroom stall, but I do stop any time I see initials carved in stone from more than a hundred years ago, such as from the bored Civil War soldiers who held the lookout above strategic Harpers Ferry (now West Virginia) or those who carved into Jefferson's Rock on the other end of the town. Other mysterious events that some might include in these realms are the TJIPETIR tiles that have been floating out from a World War I-era ship wreck near Sicily, ocean playset Legos that have washed ashore in the British Isles from another ship wreck, and, of course, the Toynbee Tiles. I found a mylar balloon in the yard about two weeks ago and I checked it--just to be sure that no note was attached designating it as some kid's weekend pen pal project. These parallels and metaphors are all leading somewhere. I found a link to a great story of an 8-year-old girl who tossed a message in a bottle into the ocean in 1989. She completely forgot about the bottle, moved away, and, about 37 years later, the bottle was discovered and most of the note was still intact. I've been starting to see some buzz and get some e-mails about the Global HF Weekend. Thanks for the contacts. As I've mentioned, I'll post as much here as I hear on the radio and find out about, but I think that other people will be doing so as well. I've already heard from Terry's Hobby Radio Blog. He posted a copy of the e-mail that I sent out & said "I will also do what I can to note any interesting inter-continental DX as I hear it on this Blog." Awesome! I'm sure he'll find out some stuff that I don't, so be sure to check his blog before and during the weekend. Thomas from the SWLing Post blog posted the e-mail as well, and the HB blog got a big jump in hits over the past day, so that's a good sign that people will be listening. Thanks to Cool AM, I received a radio promo version of the e-mail that I sent out. I don't have a site to upload MP3 files to right now, but if you ask me, I'll send it to you. BTW, the link goes to the Cool AM jingle page, where many jingles that he produced for different stations are located. Yesterday, an unidentified station on 6880 kHz from North America broadcast relays of numerous old shortwave pirate programs, including WKND, Radio Azteca, Radio Clandestine, Radio Free Whatever, WREC, and possibly others. I tuned in late but I did hear WKND. Good stuff! Now that my dishwasher is done pumping out tremendous amounts of RFI, I might just check the radio. I've started contacting everyone that I can think of about the Global HF Weekend. It's a really tedious process that involves tracking down e-mail addresses and trying to get my e-mail program to work properly. Next, I need to post info on a few radio hobby pages. Thanks and good night! Every time I try to block copy into this blogging program, different Word styles get copied along with it and the text color is black on dark gray, black on black, etc., so I'm starting over with a fresh screen this time. 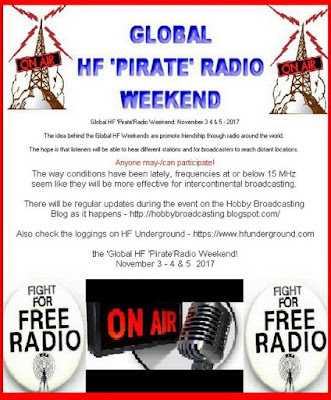 It's almost time for the next Global HF Weekend, where pirates are trying to get signals to people far away and DXers are trying to hear pirates from other parts of the world. This happens to some extent at any time, but there's a better chance of success if there's an event and it gets publicized. I've always enjoyed hearing pirates from around the world, so this is something that I try to publicize. If you haven't caught on by now, the weekends are always the first weekend of April and the first weekend of November. This works out well because it's kind of the beginning and end of DX season, and it's generally just after Halloween and April Fool's Day. The latter isn't a big pirating holiday, but it is a good way to remember the broadcasts. When Harri Kujala started organizing these broadcasts around 2010, the propagation was better and the goal was to get pirates to try frequencies on 19 meters and above, primarily either 19 or 13 meters, but stations also had success on 25 and 31. These days, it seems that the max is probably about 19 meters, with 25 and 31 being good options (but not many pirates use those frequencies). During the last Global HF Weekend, a few North American pirates put together a test for SWLs who were on a DXpedition in New Zealand--and four stations were reported there. We've also had some luck in North America with European stations being heard here. As always, I'll post any schedules that I receive here (but I won't post station names on advance schedules). So if any stations want to send schedules to me, I'll do what I can to post them and, likewise, if any listeners are planning DXpeditions, I'll be happy to post about them here, too. Thanks to all, we'll hopefully have a good weekend. 1655, 10/12, 2021+ DJ in Dutch, mentioned Boney M. Think he also said greetings to Theresa & hi to David. Laser Hot Hits: 6220, 10/12, 1850+ Music by The Smiths, ELO, & Uriah Heap. DJ mentioned that it's Sunday night, so it's a prerecorded show that's being repeated. Excellent signal. DJ talking about how there's nothing to watch on TV on Friday nights, then about preview channels, Breaking Bad, Game of Thrones, & Prison Break. Last fall, I heard Radio Pirana International for the first time since 1992. 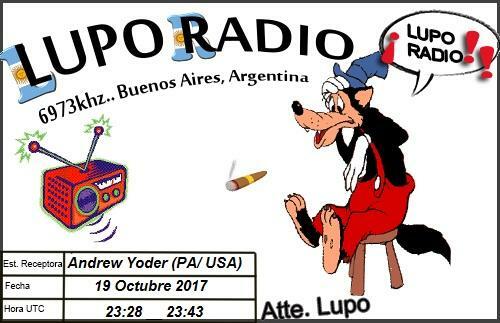 On Tuesday evening, Chris Smolinski logged Lupo Radio, which claims a location in Argentina. Digging around a bit more, I found some links to Radio Compania Worldwide (RCW), which claims a location in Chile. In the past couple of years, I've seen that a station or two from Brazil has tested (such as Radio Cidade Oldies). It looks like we might be at the beginning of a pirate radio revival in South America. Chris speculated that some of the weak carriers that we hear around 43 meters might be South American pirates and I tend to agree. Chances are good that some of the carriers are also North American pirates testing homebrew equipment, too. For that matter, I've seen some people test low-power equipment into an inadequate antenna (such as a wire across the floor), not expecting it to get out anywhere, but I wouldn't surprised if a few people could hear the weak carrier from it. Enough speculating about the sources of weak carriers on 43m and back to the topic at hand: South American pirate radio . . . RCW, in particular. I didn't post for "talk like a pirate day," but at least I'm posting on 10/4, which, to the best of my knowledge, has never been counted as any kind of a holiday. Seems like a great day to celebrate the CB band, though. If I'd been home and near my receivers today, I would've scanned around at least a little bit so that I could talk about what I heard or decoded today. So, no loggings or SSTV scans from outbanders. So, here are some links. First, a recording of someone playing music in the outbander area. Next, a pirate CB ghost story that also works well for upcoming Halloween as well. Be on the lookout if Angela is "here"
I also found a few YouTube videos of Radio Lupo broadcasts. Most are really rough recordings. Here's the best one, received on a homemade regenerative receiver near Buenos Aires, Argentina: https://www.youtube.com/watch?v=kDTsstAU9tw. With the next Global HF Pirate Radio Weekend coming up in a month (on November 3-5, 2017), it's exciting that another South American station is active.